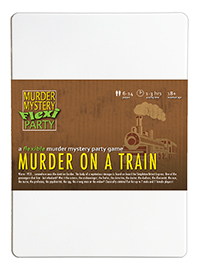 You've been invited to play the role of Mr Big in Murder on a Train. In the coldest month of 1933, somewhere near the Austrian border, passengers aboard the Simpleton-Orient Express experience a murder that will change their lives forever! But who killed mysterious stranger John Doe? Join us to find out whodunit! You are a strong man. No one told you to dress for dinner so you’re still wearing your leopard-skin leotard with a wide black belt and black boots. At least your handlebar moustache is smartly waxed and curled. Don’t forget your dumbbells! Born Pawel Pawel, you enjoyed bodybuilding alongside your academic studies from an early age. Your father, a car mechanic, used to let you lift up cars while he worked on their exhausts - until one fateful day when a small adorable kitten ran into the workshop. You still think it wasn’t so much losing a father as gaining a small furry kitten. You named your cat “Dad” and take it everywhere with you, even on long train journeys. I’m Mr Big, but most people call me ‘The Strong Man’. I hit things for money. I’m on my way to Budapest to join circus there. They want me to hit lion hard in face. I say how much? I’m so sorry this has happened. How much longer we wait?